In addition to the 11 songs that appear on the standard version, this Deluxe Edition CD features 3 Bonus Tracks, Sawyer's Any of My Trouble and Silent World, as well as Bittersweet. Also featured on this CD is Sawyer's first single, Take It All. Fans old and new will love the first studio recordings of Sawyer's Still Here, What I've Done, 4 Pockets and the title track, A Good Storm. A Good Storm also features collaborations like Sawyer's spirited Stranger, the duet with Mia Z, and an alternative version of 4 Pockets created with Sawyer's coach Pharrell Williams. 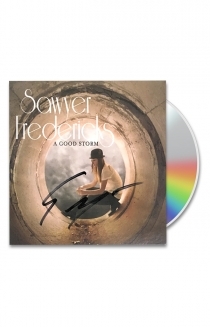 For a limited time, all CD's are hand signed by Sawyer.